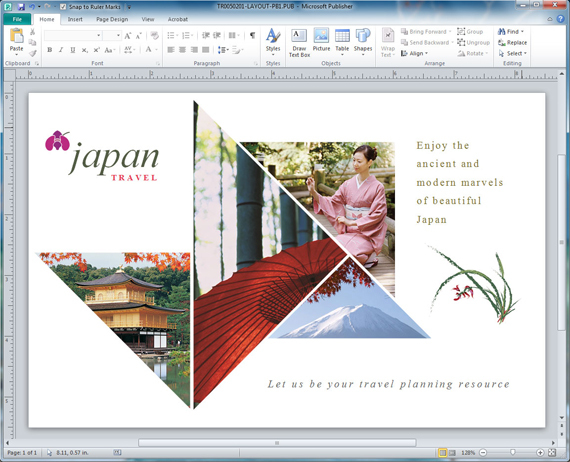 When designing a marketing piece, your layout might require an image to be a shape other than a square or rectangle. Publisher makes this easy. You can put images in circles, rectangles with rounded corners, triangles, or any number of shapes available in Publisher. In this tutorial, I will show you how to insert a picture into a triangle shape. Click Insert > Shapes, then select a shape. Draw the shape on the page to the size required. 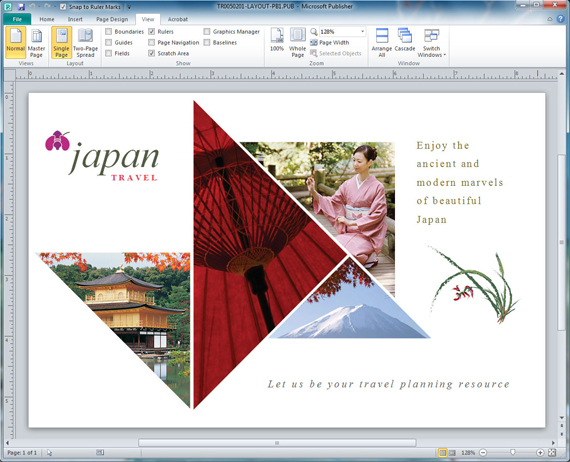 In this example, I will be using a travel postcard template from Stocklayouts. 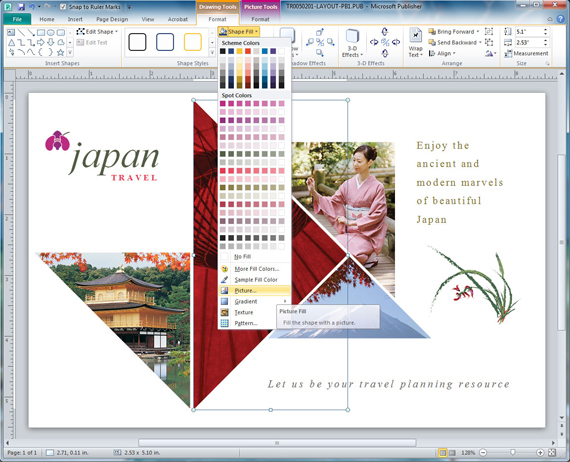 We already have a triangle shape in our layout, so we can begin with changing the shape’s image. First you will need to size the image properly to match your shape. Insert the image into the layout. Click Insert > Picture, then select an image. With the image on top using the shape as a guide, crop the image to match the dimensions of the shape. Crop to the top, bottom, right and left points or to the edges of the shape. Next you will save the cropped image. Right click on the image and choose ‘Save as Picture’. Save the image to a location on your computer. The default name will be Picture1.png. Delete the image from your layout. Next, We will reinsert the saved image from the file into the shape. Now you can insert your cropped image into the shape. Click Drawing Tools, and then choose Format > Shape Fill > Picture on the Shape Styles section. Navigate to the location on your computer where you saved Picture1.png. Select Picture1.png and click Insert. If your shape isn’t exactly the shape you need, you have the option to edit the points. Select the shape that you want to change. Click Drawing Tools > Edit Shapes > Edit Points. Are you using an older version of Publisher? Fill an autoshape with an image in Publisher 2007 or Publisher 2000, 2002 or 2003. Make your own postcard with postcard templates from StockLayouts. 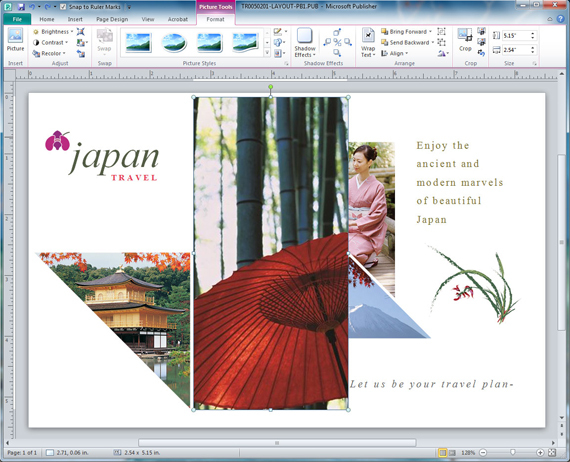 Get Publisher postcard templates from LayoutReady.com – templates for Microsoft Word and Publisher. Learn how to customize templates quickly and easily with helpful tutorial videos. Try a free sample template from StockLayouts.